Women love jewelry. Women love large, shambling, goo-filled undead creatures. 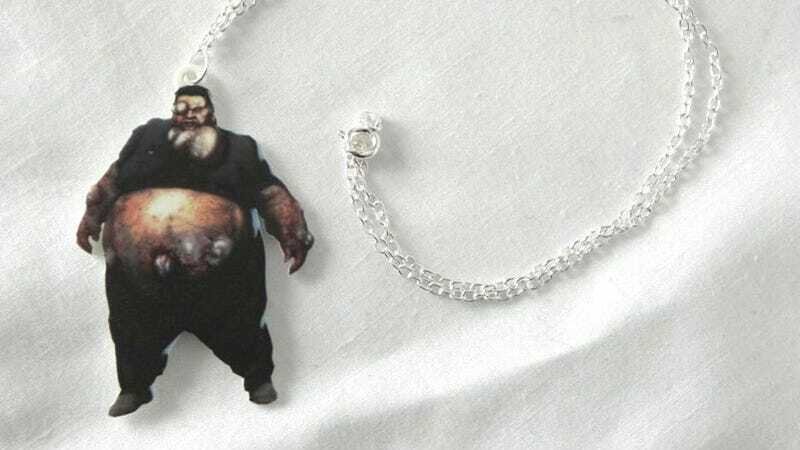 Combine the two and you've got a one-way ticket to a night of messy romance, thanks to this charming Left 4 Dead Boomer necklace. Video game jewelry artist DeadlyPretty is a big fan of Valve's Left 4 Dead series, and as it happens she creates charms, rings, and necklaces for big fans of Valve's Left 4 Dead, along with Resident Evil, Kirby, Ghostbusters, and more. This particular piece caught our attention because who wouldn't want a ticking time bomb of virulent pus hanging about their neck? As DeadlyPretty herself puts it, "He's kinda lovable and who wouldn't want to give him a big squish." If you're seeing the sort of woman (or man) that would appreciate this sort of thing then congratulations, you've won. I have no idea what you've won, but you've definitely won.